Here the symbol '→' is used for moving our menu from left to right side. Here I have included menuKey attribute, this is custom attribute included for taking handle of the menu actions in controller side. 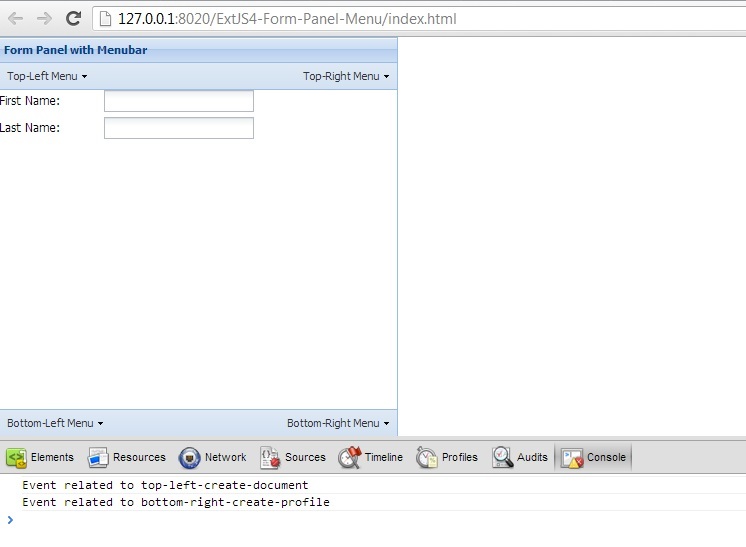 Let's see, how to take a control of form panel and corresponding form menu actions in controller. This is very tricky part when you are in beginning stage and this is my controller code for above view. 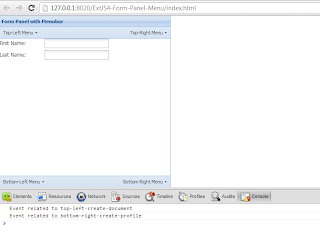 During rendering of an application, the Ext JS will create an object of 'Ext.menu.Item' for tbar, lbar, bbar, and rbar based on its configuration. So I can take a control of all menu items by using xtype and menuKey. menuitem[menuKey] - Here menuitem refer the xtype of 'Ext.menu.Item' and menuKey is our custom attribute. The result of above example is given below.